Chicago – The musical mind of native Chicagoan Scott Fischer has been described as a colorfully symphonic amusement park. Whether it’s a song-length concept piece, a full album, a rock opera or something else entirely, big bright melodies and ambitious composition always take center stage. As a contributor to Zappacast (the official Frank Zappa podcast), a performer in The Rod Stewart Experience with the legendary Carmine Appice and now on his seventh album, it’s no wonder this latest release is titled “Open 28 Hours”: Whatever you’re expecting from Fischer’s Flicker, you’re going to end up with more. “Open 28 Hours” revisits the humor and camp of Fischer’s previous musical bodies of work, and also maintains a musically mature songwriting style and Fischer’s signature elastic vocals. Part prog, part power pop, part funk, part piano magic, part 80’s extravagance and all at once endlessly intriguing, “Open 28 Hours” plays like a diverse mixtape from another planet. Diversity is not only this band’s strong suit, but its card to play in an industry where singular genres seemingly come hardwired in these days. Instead, Fischer’s Flicker has something for everyone without kowtowing to trends or passing whims. Good songs are universal, and this is a record that’s full of them. Anchored by odd time signatures filled with sweeping arpeggios played in unison, “Spiders” still could find a home on rock radio thanks to its harmonious structure, while the obscure Kinks cover “No More Looking Back” honors its muse in keen Fischer-esque fashion. Album starter “The In-Betweener” rides high on a soul-rock groove, and although closing number “Zen” is far and away the album’s most serene track, it does so in a way that still packs a punch. This is all without mentioning the nearly 10-minute epic “Mother of a Ship,” where an existential crises leads to a chance meeting with an alien who offers the protagonist all he can dream of in exchange for fellow humans who are taking up space. It’s a premise that leads to discussion and questions on the listener’s end, sprawled over a blissful, enormously enjoyable funk/prog backdrop. Granted, Fischer’s ideas are big and the delivery is equally so, but the ideas presented are mainly about the little things we can all do to stay happy (or at least, retreat from the darkness). More so than the length of time given, the first word in the album’s title is key: These songs are open, in every sense. Taking it all in, like any great piece of art, is a process and if given the time, this seventh album pays off for the listener in spades. Chicago, IL – From the first moment of “Black Mariah,” the lead-off track to the sophomore LP from Fischer’s Flicker titled “Fornever and Never”, it’s clear that bandleader Scott Fischer is up to something interesting. The grandiose piano, the nimble guitars, the pounding drums – it sounds a bit like a throwback to 70’s pop excess. Once the vocals come in, Fischer’s decidedly modern pop sensibilities pull everything together in an unexpected way. If “Black Mariah” is an impressive opening statement, the second track, “Dead To Me”, is the unmistakable sound of a band winning you over. The track’s syncopated bounce and Fischer’s languid drawl show a genuine love for the piano men of yore, simultaneously creating something as familiar as it is fresh. “Halo of Flies” opens with an eerie, dissonant guitar riff followed by downright pummeling guitars. The Alice Cooper-penned rocker blooms with droning bass, psychedelic guitar effects and Fischer’s voice taking on a sneer that is undeniably faithful to the source. “Mrs. Rogers (& the Land of Make-Believe)” is an unnerving whirling dervish with Middle Eastern roots, “Dancin’ Girl” is a smooth R&B jam, complete with a sultry guitar solo, and the title track shows off pianistic prowess before exploding into a Bat Out Of Hell-styled multi-movement epic. But somehow – despite the completion of such an ambitious album, one showing a depth and range of musicality most artists will never achieve – Fischer still isn’t satisfied. “We’re actually already halfway complete with the album that will come out next, and we’re aiming to have that one released within 12 months,” he said. Scott Fischer’s brain is like a vast musical amusement park and he wants to take us all on a thrilling ride. Fischer’s Flicker is the latest brainchild of Fischer, a Chicago native, and marks the next step in a musical evolution that began over 15 years ago. While Fischer’s Flicker’s debut album, “Katmandon’t” is more mature sounding than Fischer’s previous efforts, it stays true to the core of Fischer’s music with big melodies and ambitious composition. Fischer’s earlier projects include Deja Voo Doo and it’s ambitious release “Carpe P.M.: Honor Comes Only After Humility”. Notably, Deja Voo Doo performed live at Zappening 2000 (a tribute festival to Frank Zappa). After several years of writing and performing, Deja Voo Doo evolved into Powderhouse and then into Babaganoo. After a hiatus, during which Fischer honed his skills while touring on the corporate/cover band circuit which included a stint in The Virgin Islands and large profile shows at Summerfest and Vince Lombardi Awards, Fischer returned to his passion for original composition and formed Fischer’s Flicker. The band is comprised of Deja Voo Doo alumni including Mario Licciardi and Tim Kubiak on guitar, Turan Yon on bass and Tim Gavin on drums. 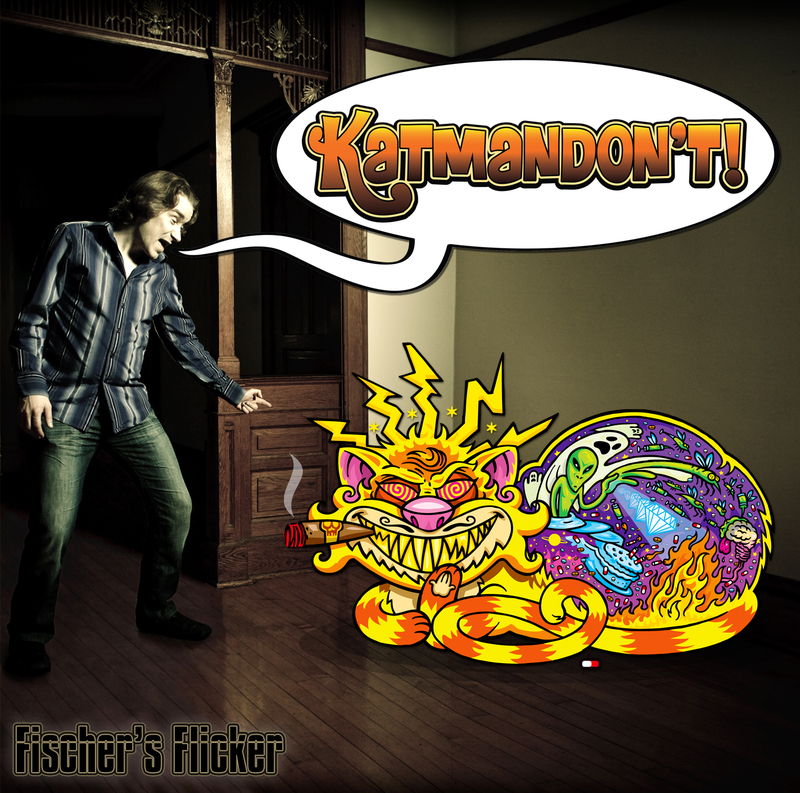 October 8, 2012 – Chicago, IL – One of the most eclectic releases of the year has finally hit the shelves, Fischer’s Flicker’s debut CD “Katmandon’t” – an unusual assortment of weirdness and musicality that sets the album (and group) in a class by itself. 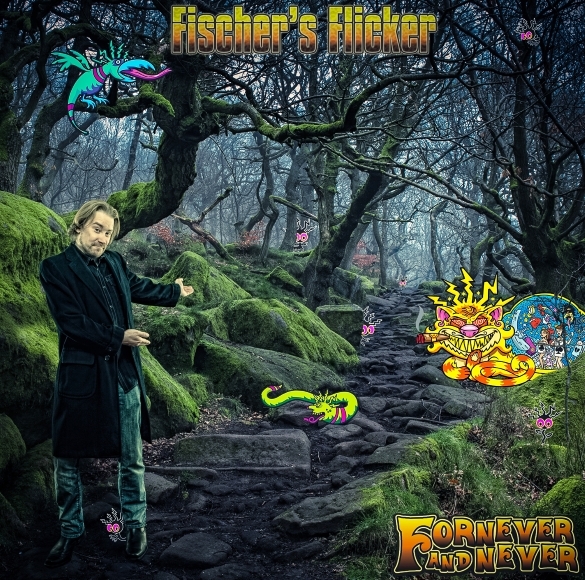 Formed by musician Scott Fischer, whose brain is like a vast musical amusement park, Fischer’s Flicker is his latest artistic brainchild, and marks the next step in a musical evolution that began over 15 years ago. While Fischer’s Flicker’s debut album is certainly more “mature” sounding than his previous efforts, containing none of his trademark humorous rock tunes, it stays true to the core of Fischer’s music with big melodies and ambitious composition. This, coupled with live performances that include extravagant and imaginative video installations that sync up with the band’s live performance, will make you want to jump right back in line for another ride! Scott Fischer, a Chicago native, has been writing and performing music since he was a teenager. In 1994, he founded Deja Voo Doo, and in 1998 released ‘Carpe P.M.: Honor Comes Only After Humility’, a highly ambitious concept album whose success led to Fischer’s involvement in Zappening 2000 (a tribute festival to Frank Zappa). It was during the shows to support the release of ‘Carpe P.M.’ that Fischer began to develop and refine the multi-media aspects of his live shows including custom-designed “living TV heads” that synced up to the band’s live performance. Says Scott, “It frustrated me to see people in attendance of a live show and giving a solid 8 collective minutes’ worth of attention to the act, intermixed with catching up with old acquaintances, refilling cocktails, relieving cocktails, smoke breaks, etc. I wondered how I could find a way to capture, say, 16 minutes’ worth of attention. I felt that I needed to hit the audience with another sense in addition to wowing their ears. Right between the eyes was the answer! I grabbed hundreds of hours’ worth of B movie sci-fi, student films and documentaries and then, in turn, spent hundreds of hours myself creating videos that evoked emotions pertinent to the songs they were created to sync up with. The videos are definitely a big part of the live show and what hopefully separates us from the others.” In order not to lose the “organic” feel in concert, a live VJ was employed to take on the painstaking task of “vari-speeding” the videos to correlate with the live band.